It's seems that there are problems if just following the instruction in their wiki page. Try the instructions below if you have problems while installing nox. Make sure you are using Ubuntu 12.04 64-bit, so that there won't be any difference. http://heron-note.blogspot.tw/2013/10/stm32-development-environment-setup-on.html Follow the instruction in this site to setup the STM32 development environment. in file "ecosenv.sh", modify "ECOS_REPOSITORY=/home/<username>/ecos/ecos-3.0/packages ; export ECOS_REPOSITORY" to "ECOS_REPOSITORY=/home/<username>/ecos/ecos/packages ; export ECOS_REPOSITORY"
press "Build" -> "Generate Build Tree"
Though Mac OS is based on FreeBSD, but still lots of unix-based tools are not as good as those on Linux. And, it turns out people start to use "port", "brew", etc to get the tools they want. However, in my point of view, "port", "brew", etc are still not good as "apt-get" or "yum" since they are not well integrated. I don't even need the GUI of Ubuntu. Also, the machine saves its state instead of turning off, so I don't have to wait long. Does the number of Cores = the number of kernel threads? "Does the number of Cores = the number of kernel threads?" While we were studying for the midterm of Operating System, few people started to ask this question. It seems that the textbook, "Operating System Concepts (by Abraham Silberschatz, Peter B. Galvin, Greg Gagne)", doesn't explain this clearly enough. Therefore, I started to find out the answer on the internet. Here comes my study. NO! The maximum number of the kernel threads can up to around 15,000 on a general machine. And, the number of the cores mostly are round 2~4. It means that "one core can run more than 2 kernel threads in the same time", which is called "Hyper-Threading". I've been working on this app, "Pitch It", for around one month. This interesting work is cooperated with Shumin, who has brought out lots of beautiful design and being a great partner. "Pitch It" is a note guessing game. It plays a music note and ask to the user to tell if he/she can tell which note it is. People define a person who have "absolute pitch" or "perfect pitch" if he/she can answer more than 70% of the questions. 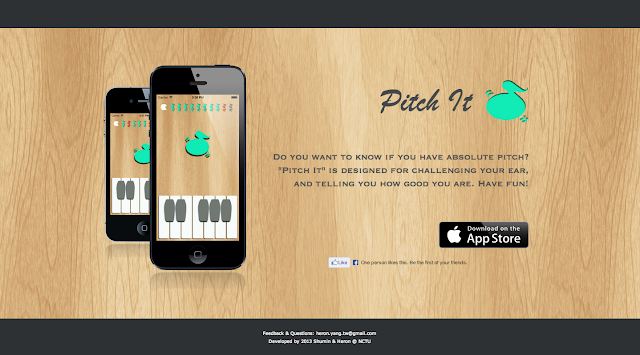 With this app, the app can tell if you have "absolute pitch" or not. On the other hand, this app is fast-implemented. I wanted to see how the Apple Store distribution works. That was a little complicated, and take a long for app reviewing by Apple. There, I write done time when the state is changed of this app on iTunes Connect. It means that takes 6 days for "Waiting For Review" state, and less than two hours for them to review and release.